Mozilla Sunbird for Windows XP - a separate tool for interaction with the calendar and the ability to integrate into the services of Mozilla. The application allows you to create a to-do list, add plans, meetings according to a set date and time, supports displaying notifications and event maps by day, week or month. 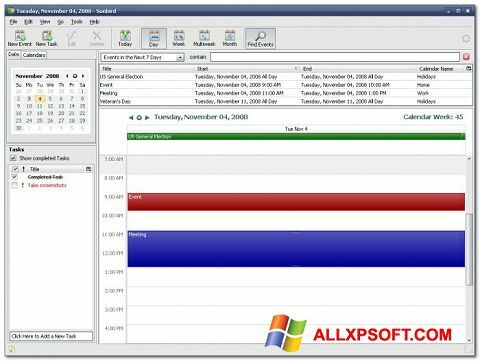 The program is able to interact with the mail client to organize scheduled mailings, includes a search tool with filtering function by context, date or type of event. The utility runs in the background, can be used as a standard Windows calendar. You can free download Mozilla Sunbird official latest version for Windows XP in English.